A number of countries have issued travel advisories for Thailand – especially Bangkok – due to the current state of political unrest in the country. As a result of 27 deaths and nearly 1,000 injuries that have been reported since protests began near the end of March, adventure travel specialists like Mondo Adventure Travel are looking to find alternative destinations for adventure seekers. Vietnam, Laos or Cambodia would be great alternatives for clients looking to stay in Asia. Thailand is one of the world’s great destinations for travellers looking for adventure so when Thailand’s Prime Minister Abhisit Vejjajiva declared a state of emergency in April, travel agents and tour companies around the globe were scrambling to ensure the safety of their clients and friends. While Canada and Britain have lifted their warnings against travel to Thailand, the United States and Australia have not yet done so. However the Canadian government still has a regional warning in effect for Bangkok. Tourism accounts for 6% of Thailand’s economy, and while it is too early to determine what effect the 30% drop in passengers arriving at Bangkok airport in April will have on Thailand this year, it is believed it will be quite substantial. Hopkinson tends to keep an even perspective on abnormal situations like the unrest in Thailand. “We send people all over the world and there are always things happening that affect some or all of us." At this point in time, it is unknown how long the situation in Thailand will remain on heightened status but until it is resolved, travellers should be advised to make alternative plans. 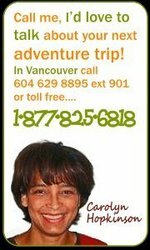 Carolyn Hopkinson is the owner of Mondo Adventure Travel in Vancouver, British Columbia. Carolyn has been in the travel business for over three decades and is recognized as a leader in the industry. She and her team offer personalized service and great deals on worldwide adventure travel. Carolyn can be reached at 1-877-825-6818 ext 901.